The latest remarks from the straight-talking Sarri came four days after the Italian coach questioned the attitude and character of his squad following a 2-0 loss to Arsenal in the Premier League. Only two months ago, Sarri said World Cup-winning France midfielder N'Golo Kante didn't have the technical qualities to play as Chelsea's holding midfielder and criticized his display in a loss to Tottenham. Now it is Hazard, Chelsea's most creative player, who has been publicly singled out by Sarri as he spoke in a news conference ahead of the second leg of Chelsea's English League Cup semifinal against Tottenham on Thursday. 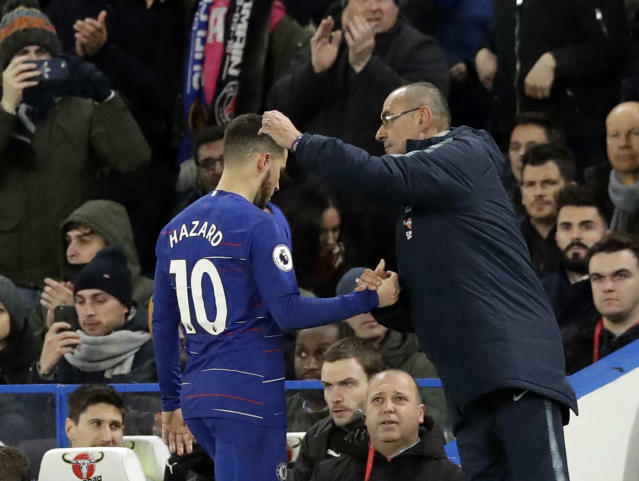 "I think he has to do more," Sarri said of Hazard. "Because the potential is higher than the performances. He has to respect first of all himself. He has to do more. You know very well that Eden, at the moment, is a wonderful player. But he's an individual player. He's an instinctive player. For him, it's very difficult to play only in one position." Hazard has been asked to play as Chelsea's center forward in recent weeks, partly to absolve him of any defensive responsibilities but also because Sarri's two other strikers, Olivier Giroud and Alvaro Morata, haven't been scoring enough goals. It explains why Chelsea is in final negotiations to sign Argentina striker Gonzalo Higuain from AC Milan. Hazard has looked frustrated at times in his new role and often drops deep to get possession, leaving Chelsea without much of an attacking presence. 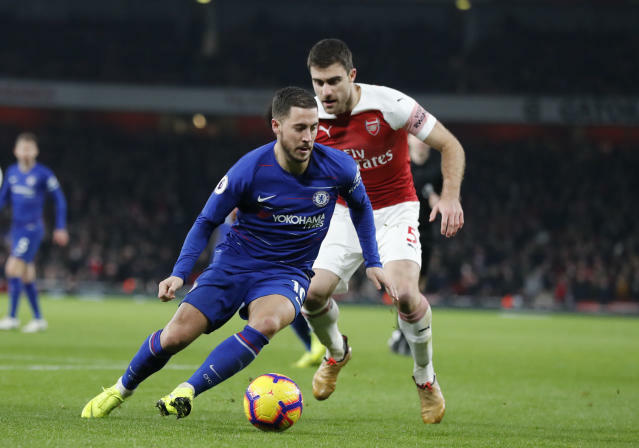 The team has scored just eight goals in its last nine games in all competitions, and couldn't muster many chances in the meek loss at Arsenal after which Sarri vented his frustration. "I do think we need to change the mentality," Sarri said Saturday, "and I do think within the group of players we do have that ability and the characteristics to change." Hazard could be one of them, according to Sarri, but only because of his ability with his feet rather than his influence in the locker room. "He is very important for us, of course, because he is a great player," Sarri said. "He always can win the match in two minutes. Sometimes in one minute. But, at the moment, he's not a leader. He's a great player." Hazard's long-term future at Chelsea is uncertain amid reported interest from Real Madrid, with Sarri saying the forward is weighing up "if he wants to stay here or if he wants a new experience in another club." "I think Eden at the moment doesn't know the final choice," Sarri said.